The easy circular walk from Grasmere village, past Dove Cottage and down to the River Rothay at White Moss, and then back to the village along the side of the lake, takes an hour and a half if you dawdle. It's perfect before lunch on a cold winter Sunday. Popular images of the Lake District usually involve reflections, mountain scenes and wide open views, perhaps at sunset. This Sunday there was fog, and at times quite dense fog, so none of that was possible. The lake itself was also partially frozen, so its surface was more like an unpolished stone than the facet of a jewel. This wasn't a picturesque Lake District, but a cold, hunkered down one. While there was no chance of catching the fells reflected here, fog makes a great background for silhouetted trees and mysterious whited-out landscapes. This meteorological myopia shrinks the world and makes what is close by more significant: the edge of the lake, a rock, a stand of trees merging softly with the sky. As a photographer you can take advantage, focussing close and blurring an already obscured background, embracing the dead space. And since the fog drains everything of colour, black and white seemed appropriate here. Colour was later restored by a pint of Hardknott Cool Fusion poured slightly too cold, but accompanied, appropriately enough, with a chicken pie in Tweedie's Bar, Grasmere. Images taken with an Olympus OMD-EM1 and 12-40mm f2.8 lens, mostly at 12mm. This was taken in Grasmere churchyard from a distance of no more than three metres. 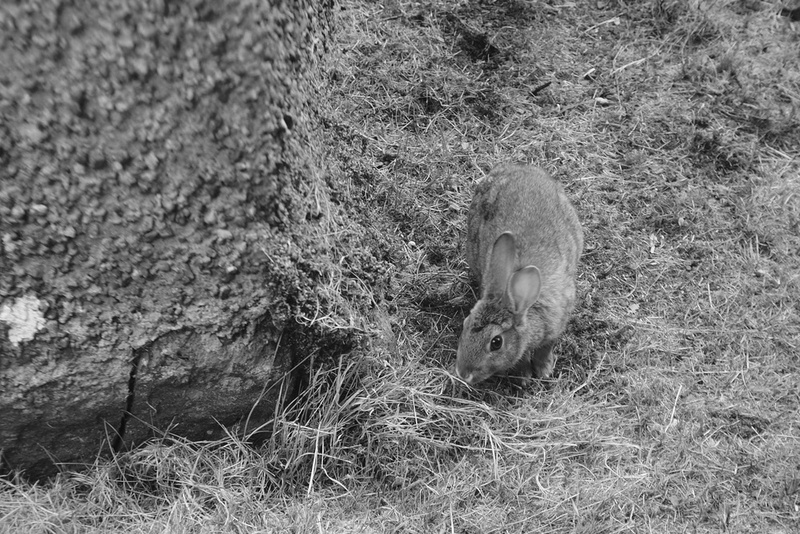 When a wild rabbit allows you to get that close it usually means there's a problem, but there was nothing obviously wrong with the animal, which was happily grazing amongst the feet of tourists.